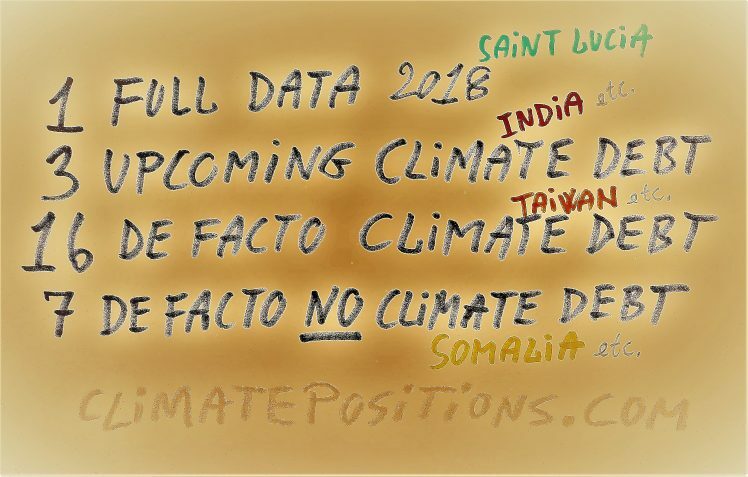 Combined, the Climate Debt of the 16 countries with lack of data amounts to roughly 2% of the combined Climate Debt of the 164 countries with full data. Aruba, Djibouti, Reunion, Vanuatu, Kiribati, Cape Verde and Somalia (all seven with lack of indicator data) would have no Climate Debts with estimated data. Finally, Montenegro, Netherlands Antilles, Occupied Palestinian Territories and South Sudan have so far no data on Fossil CO2 Emission. ¹Indicator estimates: Taiwan (Footprint set at the level of Japan, Forests set at “unchanged”, GDP-ppp set at the level of Germany); China Macao (Environment and Footprint set at the levels of Singapore); Iceland (Footprint set at the level of Ireland); New Caledonia (Environment set at the level of New Zealand, GDP-ppp set at the level of Trinidad and Tobago); China Hong Kong (Environment and Footprint set at the levels of the United States, Forests set at “unchanged”); Guadeloupe (Environment and GDP-ppp set at the levels of Seychelles); Malta (Footprint set at the level of Cyprus); Martinique (Environment and GDP-ppp set at the levels of Chile); Grenada (Footprint set at the level of Dominican Republic); French Guiana (Environment and GDP-ppp set at the levels of Turkey); Maldives (Environment set at the level of Saint Lucia); Saint Vincent and the G. (Environment set at the level of Saint Lucia); Belize (Environment set at the level of Saint Lucia); French Polynesia (Environment and GDP-ppp set at the levels of Barbados); North Korea (GDP-ppp set at the level of Haiti); Syria (GDP-ppp set at the level of Kenya).